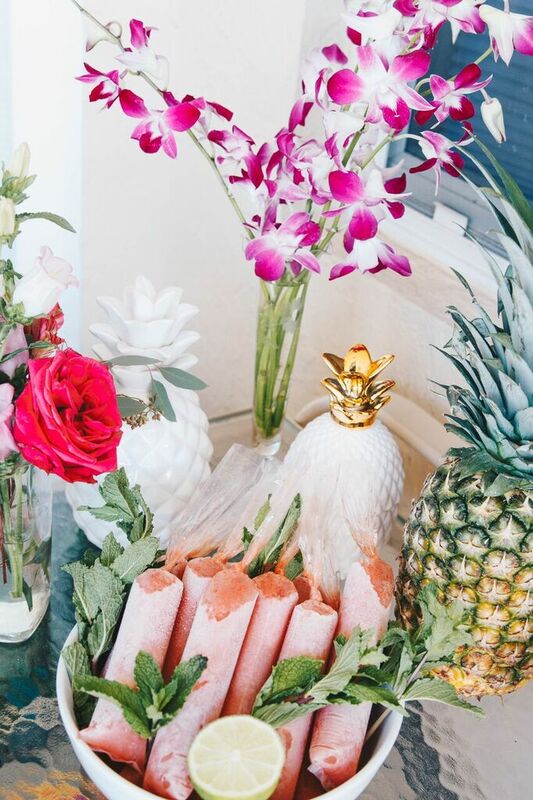 When my sister told me she wanted a tropical bridal shower I hit Pinterest and began furiously researching ideas and recipes! 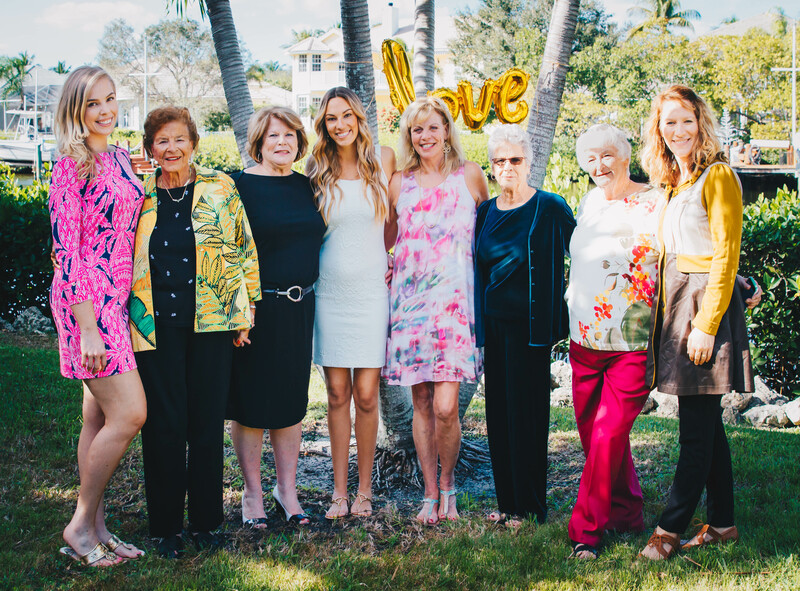 It was a brunch bridal shower that began at 11am on New Years Eve in Jupiter, Florida our hometown. Thank you so much to my step-mom Mary and to my sister Hannah for helping me with all of this as well as taking these amazing photos for this post! Check out more of her amazing photography on Instagram @hannah_claire_photography. 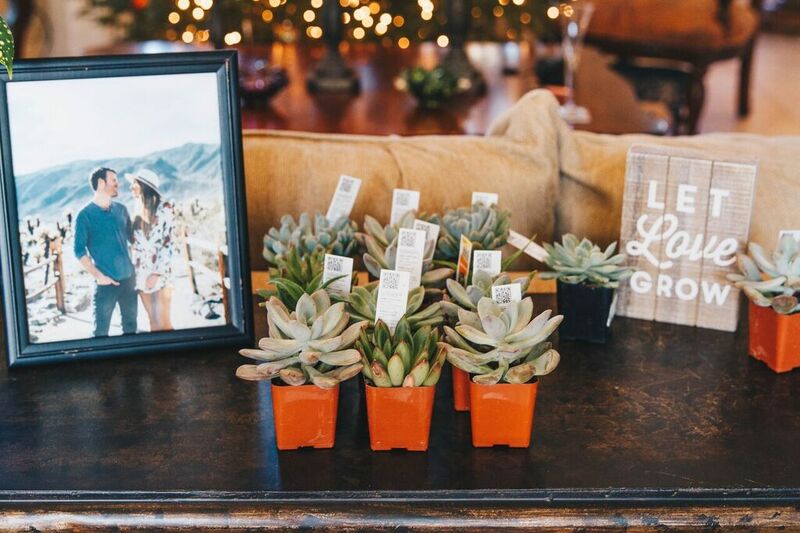 Right when you walked in the door I set up the party favors – small succulents from Home Depot next to a photo from their engagement shoot, I found the “Let Love Grow” sign at Marshall’s. 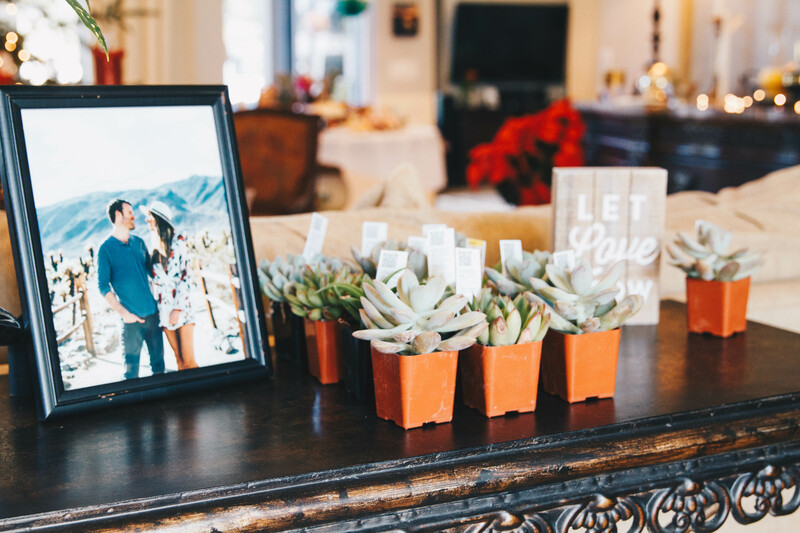 I had seen this idea on Pinterest and just thought it was so simple and sweet and a great party favor for a tropical bridal shower. 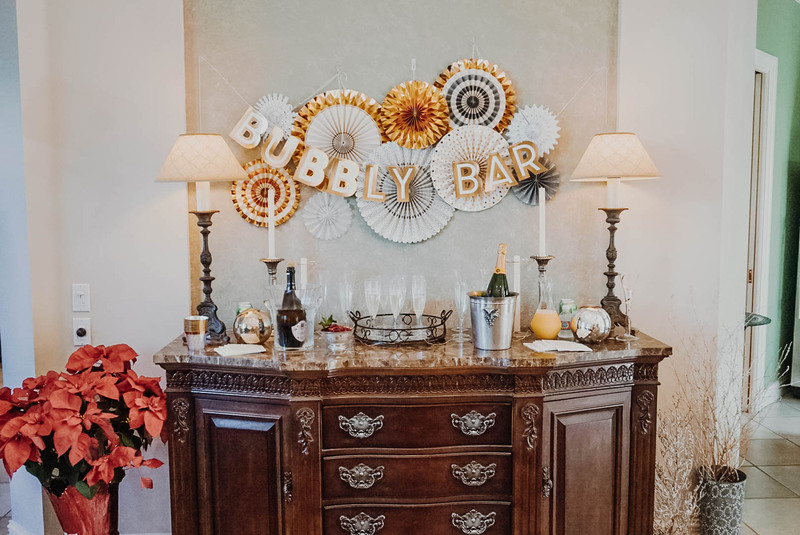 Next guests came to our “Bubbly Bar” Champagne Bar for a mimosa with fresh Florida orange juice or a cocktail with some champagne and Chambord (raspberry liquor). In the silver bowl there were frozen organic raspberries that were used as a garnish and to keep the drinks cold. 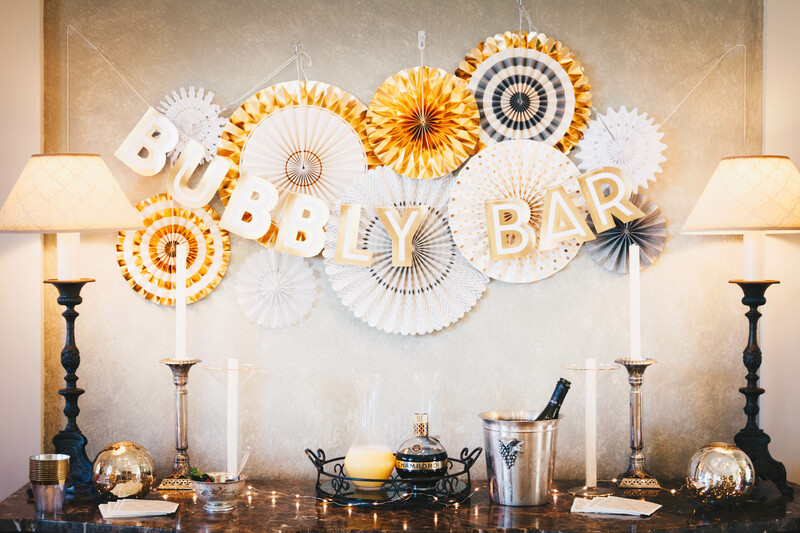 I found the Bubbly Bar sign at HomeGoods and found the paper fans (similar) at HomeGoods and Marshall’s. I used Command Wire Hooks and Command Strips to hang the fans and they did not hurt the wall or paint or leave any marks! These fans are somewhat heavy so you definitely need the command hooks and strips to keep them up. 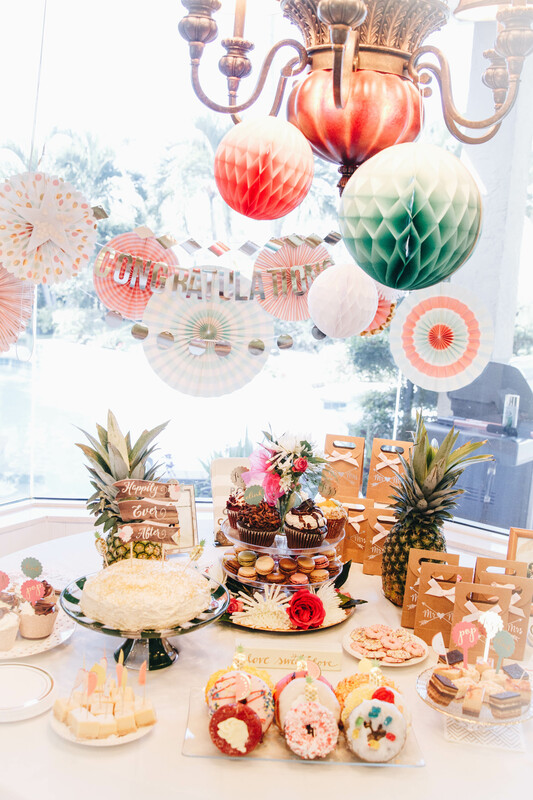 I wanted a really over the top dessert bar to wow everyone and be super over the top with all kinds of delicious goodies. 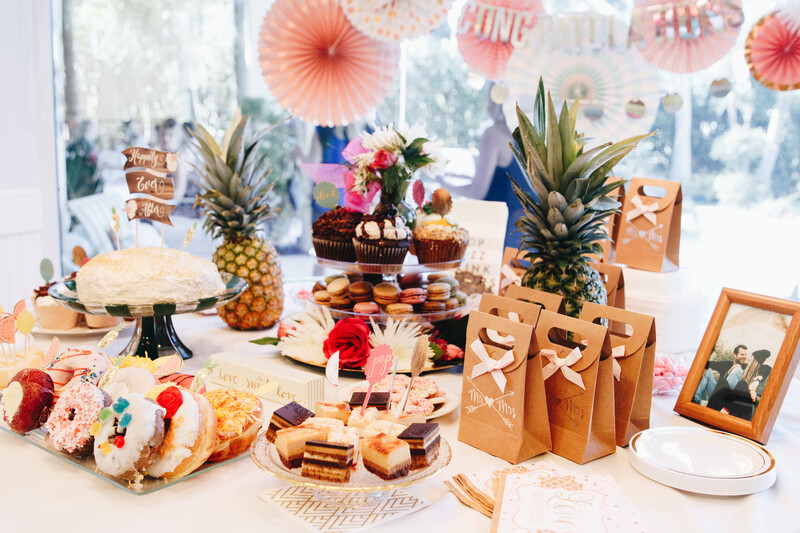 Pineapples are a great decorative touch for a tropical bridal shower. I made the cake which is a Coffee and Baileys Layer Cake (note: this recipe uses 3-6″ cake pans which even my chef dad does not have on hand, which is why mine is shorter!). The “Happily Ever After” sign (super cute alternative) was from Homegoods along with the “pop fizz clink” cupcake toppers (cute alternative, these flamingoes are adorable too, pineapples and flamingoes, or nautical ones), the Mr. & Mrs. brown to-go bags, the paper honeycombs (similar), the paper fans (similar), the glitter cupcake wrappers (similar), and the gold chevron cocktail napkins (these Palm Tree napkins would have been great too). The donuts were from a local bakery called Jupiter Donuts and they were SO GOOD! 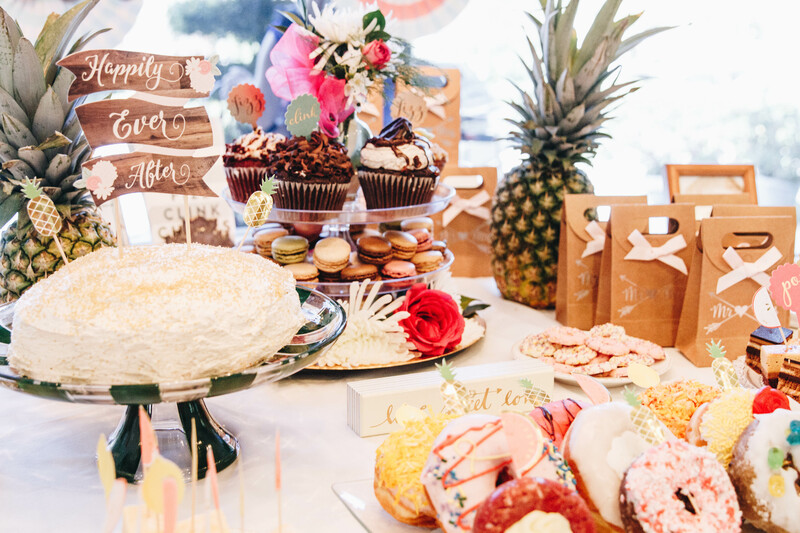 The cupcakes on the left and on top of the center piece were all from Whole Foods. The macarons, lemon squares, pink and white sprinkle cookies, and small cakes were all from the frozen section at Trader Joe’s. Because no one wants to eat this many sweets in one setting, we had styrofoam to-go boxes (these would work great) for everyone to take some goodies home for later! And of course another great framed photo of the sweet couple. My step-mom made the gorgeous multi-tiered flower center piece using a gold charger on the bottom and 2 cake stands stacked on top of each other with a small vase on top. 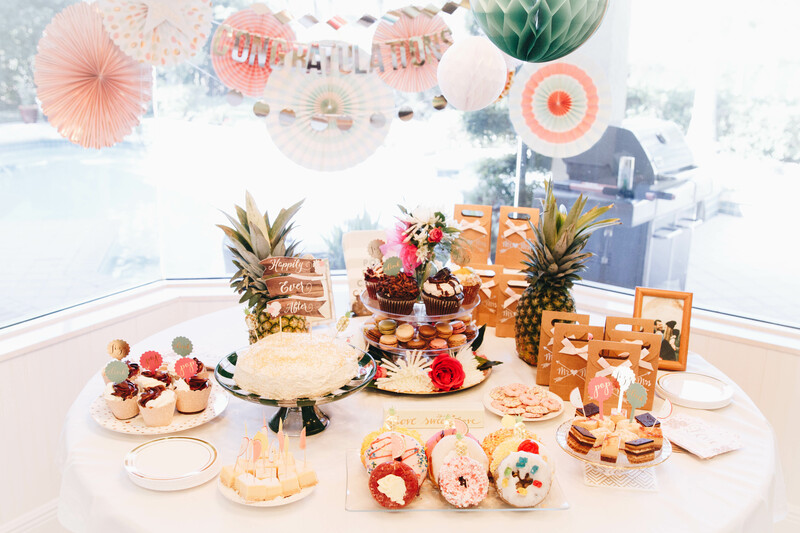 The “love sweet love” sign (another option), gold and clear cake stand, and gold and white polka-dot plate, and the “Congratulations” silver banner (similar) were all from Marshall’s. 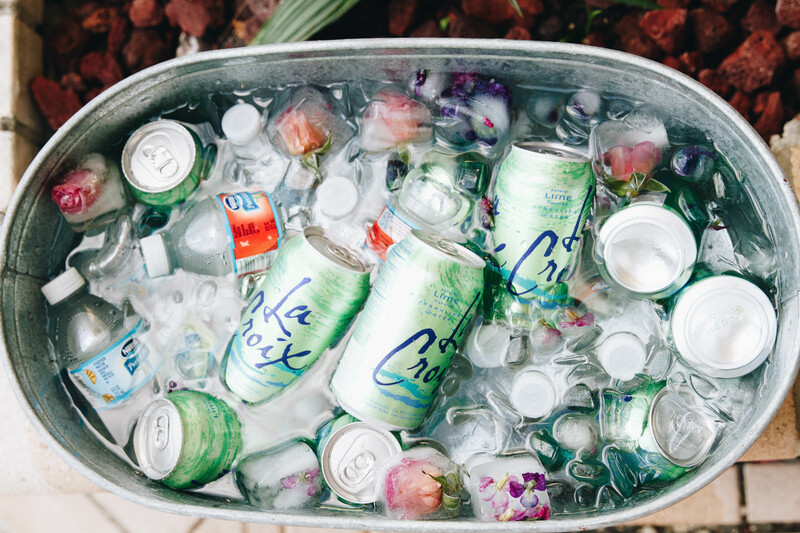 Besides champagne and wine (we had 20 guests and I bought 6 bottles of champagne and 2 of rosé which was plenty), I got a case of lime La Croix and small water bottles which I put in silver beverage bins (similar). I also got sparkling pink lemonade from Trader Joe’s in case someone wanted a fun non-alcoholic drink in their champagne glass. I learned how to make the flower ice cubes from Martha Stewart, but after experimenting with distilled and tap water, I didn’t find a huge difference and they were also cloudy whether the water was boiled or not. 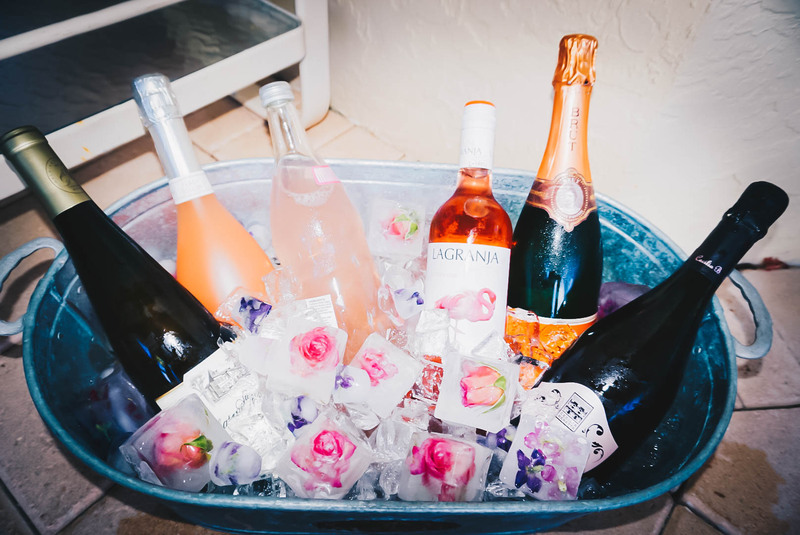 One tip for flower iced cubes- start making these a few days in advance of the party because they take a while (they must be frozen in several stages)! I used large silicone ice cube trays and bought the roses from Trader Joe’s. I also really liked how the mini ice cube trays with the smaller flowers turned out they really went with the tropical bridal shower theme. For the outside bar area I spray painted a palm frond gold and it came out beautiful! My sister’s favorite food is Eggs Benedict and because that would be nearly impossible to serve to 20 people, she made this Eggs Benedict Casserole instead which turned out great. She made this Artichoke Dip Stuffed Bread which was outstanding too. We are lucky enough to have a dad that’s a chef so he made a Quiche Lorraine and a spinach/feta/sundried tomato (Vegetarian quiche). Although it may seem a little redundant I also bought a Trader Joe’s kale and artichoke dip that was ready to serve with some crackers, that way we had food out people could snack on as soon as they arrived while the rest of the meal was heating up. 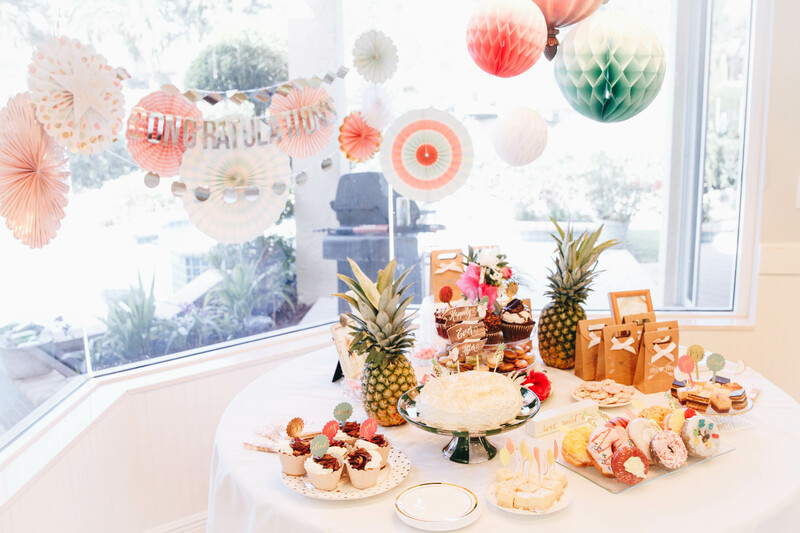 We also had a fruit platter from Publix to keep this a tropical bridal shower. 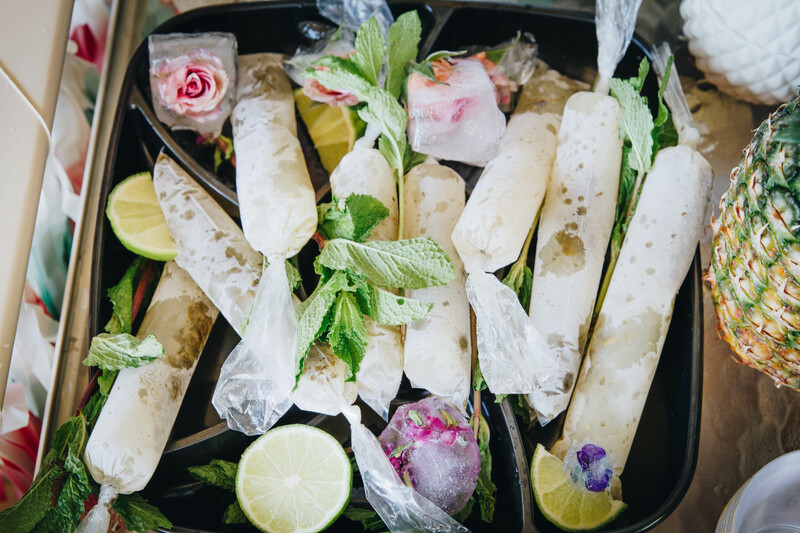 One of the biggest hits of the party were our boozy popsicles! We actually forgot to bring them out until the very end when half the guests had already left, but people LOVED them and they were simple to make! 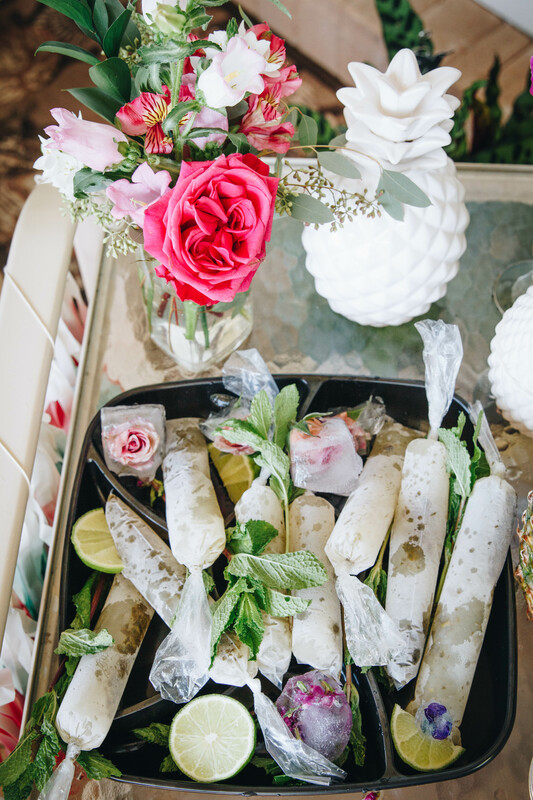 We made 2 flavors – Mint Mojito Popsicles and Watermelon Margarita Popsicles and they were a great addition to this tropical bridal shower. 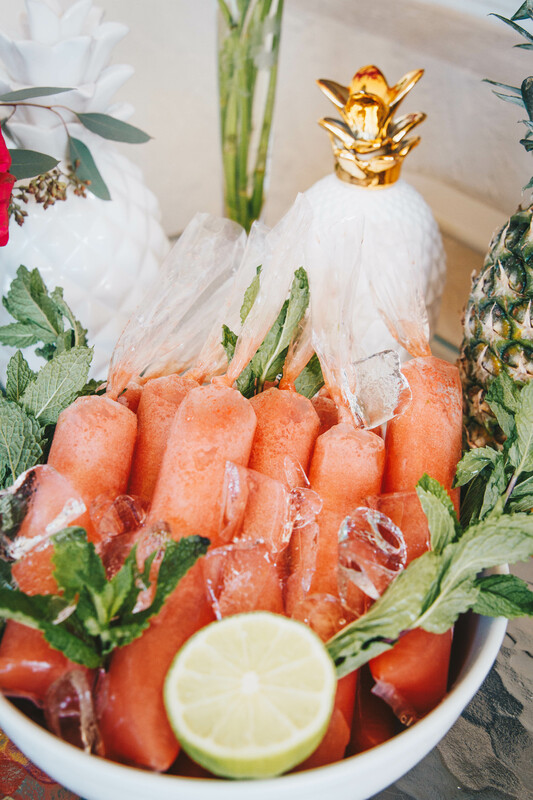 Alcohol does not completely freeze so you can’t make these ice pops in traditional popsicle molds. Instead I used these popsicle bags and tied them at the top because my fancy plastic bag re-sealer came too close to the party. 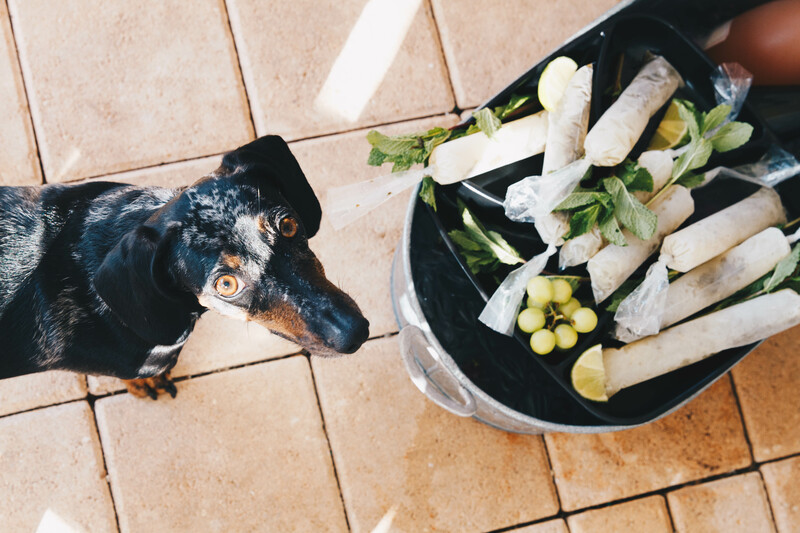 We filled the bags up about 3/4 of the way and the recipes made about 8 popsicles each. Tip: The mint mojito ones need to go on their side when you put them in the freezer, or else all the mint will rise to the top of the bag. The watermelon ones can be put in a cup and sat up right which would allow you to put some space between where the popsicle ends and where you tie the knot so when you cut the bag it won’t overflow. 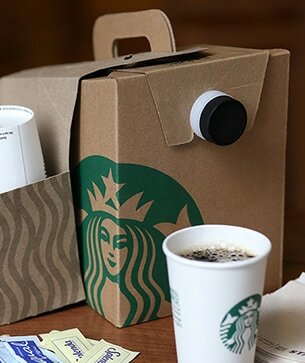 We served them with plastic cups to sit them in in-between sips because these thins were nice and strong! 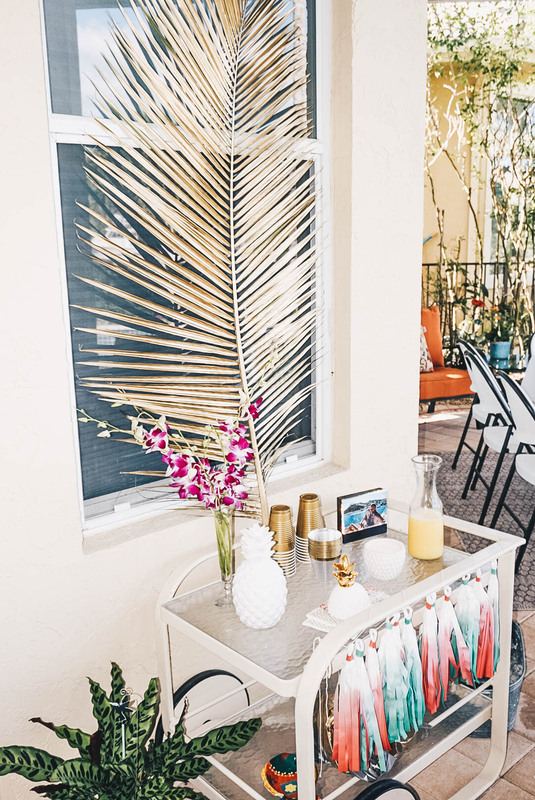 I toyed around with the idea of making a Photo Booth or photo back drop, but my dad’s house has such a beautiful back yard that worked perfectly for this tropical bridal shower. I bought this gold “love” balloon from Etsy and we paid $2-3 per balloon for them to be blown up at Publix. We tied it between 2 palm trees in the back yard and called it a day. If you remember from my Kim Kardashian Selfie Secrets post, the best lighting is indirect natural sunlight so I actually made everyone wait until closer to 2pm to take the photos so the lighting wouldn’t be overhead or making everyone squint! I’ve already posted the details on our outfits in this post and I also got an amazing blow-out at The Blow-Zone in Jupiter the night before which saved me time getting ready the morning of! Be sure to follow Hannah on Instagram for more great photos Instagram @hannah_claire_photography. 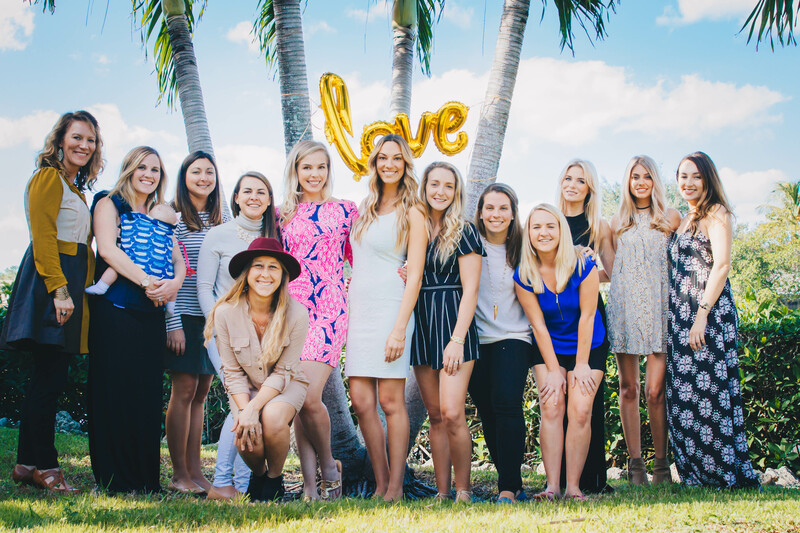 Be sure to check out my previous post about our tropical bridal shower outfits and keep an eye out for the next post where I talk about the bridal shower games!